Happy #ThirstyThursday!!! I have a strange amount of energy today, which I am going to attribute to the Vitamin B12 + B Complex shot I got on Tuesday night. Have you guys ever tried those out before? I know I told you about them last year- I was super run down and kind of sick and pretty desperate! I had one of these shots and I was like another person by the next day. I am having a similar reaction this time. I think that the only sensible thing to do on an energy filled Thursday is to have a big old Thursday Cocktail. Don’t you think? And of all the drinks I have had lately- this one was a favorite. My grocery store sells bottles of SOUR green apple juice which is amazingly like a granny smith apple in liquid form, and that is what inspired this drink. 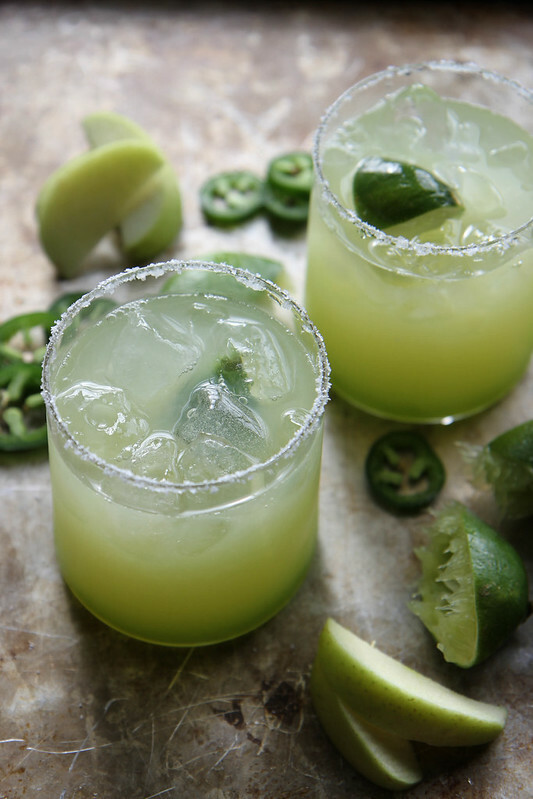 Combined with a jolt of sweet and spicy jalapeno syrup and fresh sour lime juice- it is a perfect fall cocktail. We make ample amounts of Mexican food around here and I am for sure going to be whipping these up to go with it- I think they would be an awesome addition to your next fun happy hour or even for tailgating. Yes?? Use the lime wedge to rub around the rim of the glass, then dip the rim in the kosher salt. Set aside. In a small pan, combine the sugar, water and jalapeno and bring to a simmer for a few minutes. 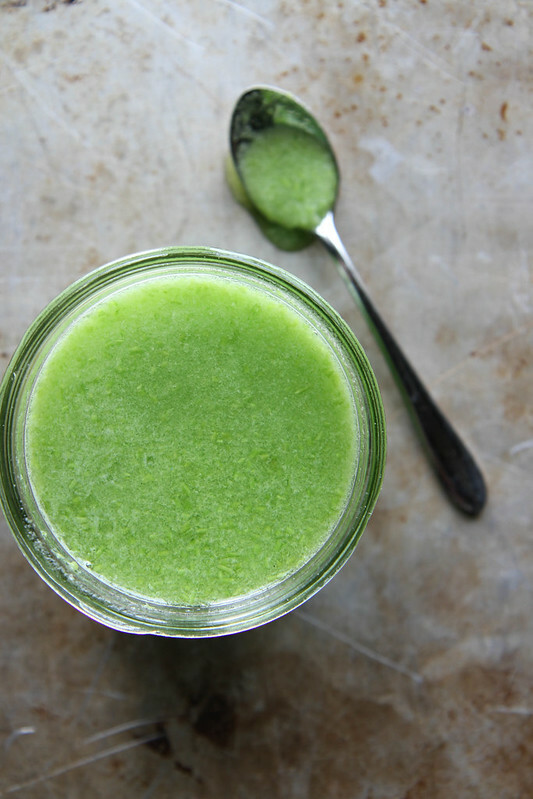 Add the contents to the jar of a blender and puree on high until smooth. Put the syrup in the fridge to chill. In a cocktail shaker filled with ice, simple syrup, sour green apple juice, lime juice, tequila and grand marnier. Shake vigorously and pour over the ice- garnish with Lime wedges. This cocktail sounds fabulous, and I am SUPER jealous of that sour green apple juice. Oh, to live in an apple-growing state again! Oh wow, I need this! I’m editing right now and would sure make editing more fun 🙂 Pinned! Sounds delicious and gorgeous photos! I’ve never had a B12 shot before…now I’m intrigued. I could certainly use a boost myself! This sounds so good, what a pretty drink! Holy crap dude this looks sooooo good! I think we’ll have them at our Day of the Dead party next week! I’m wondering about the sour green apple juice. What is the brand, and where do you usually find it in the store? What is the brand and/or name of the sour apple juice? That would be very helpful in recreating this exciting recipe! Please post! Thanks! I’ve made these at two parties recently and everyone loves them. We don’t have sour green apple juice available where we live so I just use apple juice and up the amount of lime a tiny bit. 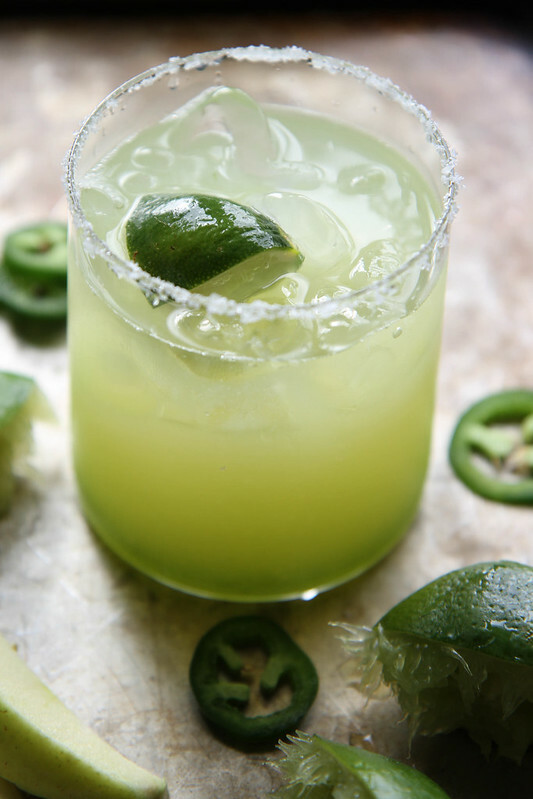 To me, the jalapeno simple syrup is what sets these apart – very unique, and delicious! Pingback: 24 Feisty Tequila Cocktails You Need In Your Life - Do You Still Hate Me? Amber- Here is the kind that I use! What an awesome combination! I love a little spice in my cocktails!